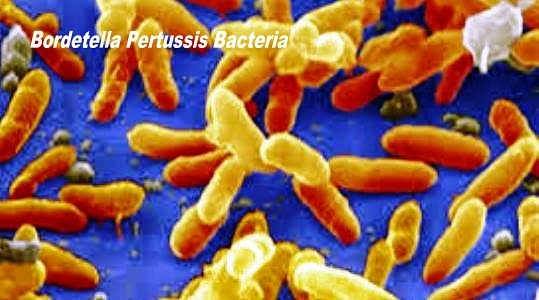 Also known as pertussis, whooping cough is a very infectious disease that is spread by bacteria called bordetella pertussis. It is spread by tiny air droplets and the age group it affects most is between one month to four month old babies. But due to effective vaccination it is now relatively rare. Before vaccination became available three out of every four children caught it at some time and a number died from it. Since the national vaccination programme was begun, more adults than children are now affected with epidemics tending to occur every 3-4 years. January to April are the peak times for it in the UK. Because immunisation is neither permanent nor complete, some adults who were immunised as children can still get it in later life although their risk of developing serious complications is less and attacks are milder. The bacteria bordetella pertussis is transferred through the air in tiny droplets when an infected person coughs, and a non-vaccinated person can contract the illness simply by being in the same room as them. The bacteria subsequently settle in the mucous lining of the throat and lungs and produce thick sticky mucus there as well as a great deal of inflammation. The early stages are similar to that of a cold, with a mild cough and cold-like symptoms. Shortly after this the more typical symptoms begin when bouts of severe coughing start, to the point where there is no air left in the lungs and the sufferer has to take a large gulp of air in to breathe again. This intake of air passing through the narrowed windpipe (larynx) causes the characteristic 'whooping' sound that gives the illness its name. These attacks can occur up to 40 times a day thereby rapidly exhausting a baby or young child as well as being very distressing for both patient and their watching parents. Thick phlegm may occasionally be coughed up during these attacks and it may even take 2 months before they fully settle down. Vomiting sometimes occurs during coughing but a high temperature is unusual. Attacks can be triggered by yawning, sneezing, eating, drinking or for no obvious reason. The diagnosis is usually made from the history and the classical 'whoop' heard during coughing. If there is any doubt then throat swabs can be taken (by rubbing the back of the throat with a swab that looks like a cotton bud) which are then tested for the presence of the bordetella organism. Blood tests may be helpful but more than one is needed at different stages of the illness to show a rise in the body's antibody levels against pertussis, confirming infection. The early stage is called the catarrhal phase, where symptoms are similar to that of a cold - a runny nose, slight cough and red eyes. There may be a slightly raised temperature at this time too. This phase may last up to a fortnight. Following this phase comes the paroxysmal phase where there are the serious coughing spasms that may last up to four weeks or more. The final phase is the convalescent phase where the coughing spasms, vomiting and whoop gradually subside - although any new infection such as a cold or throat infection can restart the symptoms once more. Some doctors have called whooping cough the '100 day cough' to show just how long and drawn-out the pattern of the illness can be. Occasionally complications can occur such as pneumonia or bronchitis, ear infections or swelling of the throat to such a level that swallowing is almost impossible. These tend to cause a raised temperature and are treated with antibiotics or hospital admission to monitor for swallowing difficulties, exhaustion or an inability to feed. Most cases of whooping cough require no specific treatment as such, although there is some evidence that the infectious period may be slightly reduced by giving an antibiotic called Erythromycin early in the illness. The crucial point is to prevent infection occurring in the first place by ensuring that all children are effectively vaccinated and this takes place routinely as part of the 'triple' DPT immunisation - diphtheria, pertussis and tetanus. These take place at the ages of two, three and four months, and after the first two injections protection is almost 100%. Contrary to some beliefs, a history of hay fever, eczema or other allergies in the family does not prevent the vaccine being given nor does being treated with antibiotics at the time (provided there is no fever present or the child is generally unwell). However, if there is a serious reaction or very high fever after an initial dose then your doctor should advise you as to whether to proceed with the subsequent injections or not. The vaccine stimulates the body to produce antibodies against whooping cough without causing the illness, and it is given together with the diphtheria and tetanus vaccines because it works more effectively if given this way. This comes mainly down to immunisation but there are other points here too. To prevent the rapid spread of whooping cough if it should break out in a nursery or institution, then other children under the age of one should not enter that area unless they have been immunised or have had whooping cough themselves. In non-vaccinated children older than one they can enter but parents should be aware of the danger of infection. For infection at home, no special precautions are necessary. 1. Has your child/you been vaccinated? 3. What does the cough sound like? 4. Is your child able to eat/breathe properly? 5. Has your child/you been in contact with whooping cough to the best of your knowledge? 1. Will my child actually stop breathing during an attack? 2. Will they go on to develop asthma? 3. When would hospital admission be needed? 4. Do nebulisers help at all? 5. Do my other children need any special kind of treatment?